This is one of those rare gems that sounds dull on paper but turns out to be magic. 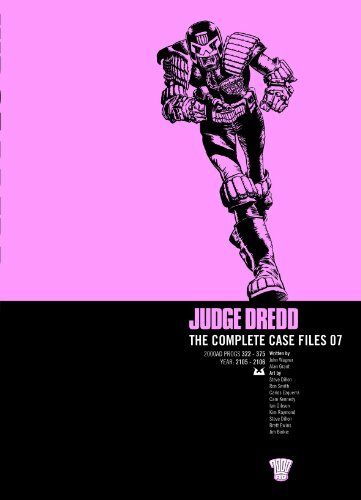 We follow Dredd through an overnight shift on the streets of the Mega-City. This isn’t about Dredd and certainly isn’t the traditional dramatic narrative. This brave idea is all about soaking up the atmosphere of the city. This is a dream for anyone wanting to play or run an RPG as it shows you just what goes on. Part documentary, part Under Milk Wood, we gently flit between the crimes occurring after dark. The suicides, the crazies, the midnight block wars, all of life is here. There are lots of stories developing in parallel and some astounding crime statistics. There are the anachronistic block names that focus on people and TV programmes of the 1980’s. Plus Hershey and Anderson make the briefest of cameos. But overall the story is a fascinating peek under the skirts of the Big Meg. Hundreds of citizens die, whole blocks are blown up, spacecraft crash, yet this is just a normal shift for the judges. After just 10 minutes in the sleep machine they do it all again. This is definitely a clever and thoughtful piece of writing particularly as it lasts seven issues. Dredd is present but the City is the Star. A really nice piece of bookending is the same crime starts both the graveyard shift and the following morning shift too. Smith does a great job and uses all sorts of layout and panelling tricks. He tries to give scope to the vast metropolis, which isn’t easy considering the limited space on the page. It is hard to convey a night scene in black and white, although he certainly does his best.